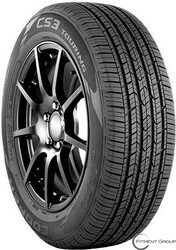 The Cooper CS 3 Touring is a great addition into the Coppers wide range of tires available on the market. With its highly formulated tread compound the tire features a one-of-a-kind StabilEdge technology. This technology ensures that the tire performs optimally both on dry and wet terrains. For those who live in snow bound areas during winter, you never have to worry. The Cooper CS 3 Touring comes with a 5- rib thread pattern, which ensures that there is increased wet and light snow traction. The Cooper CS 3 Touring also features circumferential grooves, which play a huge role in ensuring superior hydroplaning resistance. Its modern thread profile and thread compound facilitates a longer thread life. The Cooper CS 3 Touring also features a 3D Micro gauge, which ensures easy handling, and tire control. An additional feature to the Cooper CS tire is the StabilEdge Technology, this technology provides for an increased stability especially on the tire’s center. In addition, it provides for softer handling as well as on-center response. The Cooper CS 3 Touring consists of a new touring compound, which offers circumferential grooves that increases hydroplaning resistance.